This year’s Christmas Crèche Art & Music Festival features over 1,000 nativity scenes from all over the world. LANCASTER – The 19th annual Christmas Crèche Art & Music Festival opened Friday (Nov. 30) at the Lancaster East Stake Center of the Church of Jesus Christ of Latter-day Saints. The free four-day festival features one of the largest displays of nativity scenes in the western United States, as well as over 40 live musical performances from a wide range of choral groups, musicians, soloists and orchestras. This year’s participants include Highland High School, Palmdale High School, Lancaster High School, Quartz Hill High School, Pete Knight High School, and, for the first time ever, Quartz Hill High School’s 70-piece Symphonic Band. Other performers throughout the festival include Sacred Heart Children’s Choir and Bell Choir, Antelope Valley Children’s Choir, Antelope Valley College Flute Choir, Donna O Studios, Lancaster United Methodist Chancel Choir, AV Jazz Ensemble, the Oliver Bell Choir, Devotion in Motion-Island Style, Lancaster Community Orchestra, Sunday Night Singers, and many more. Sunday evening’s festivities will also feature the annual Messiah Sing-Along, which provides an opportunity for attendees to get into the Christmas spirit by joining in. The Sing-Along will be led by the Antelope Valley Symphony Orchestra and Master Chorale. A variety of children’s activities are also available in a designated Children’s Room. These will include a nativity-themed scavenger hunt, costumes and props to reenact the Nativity Scene, and other themed games and activities. 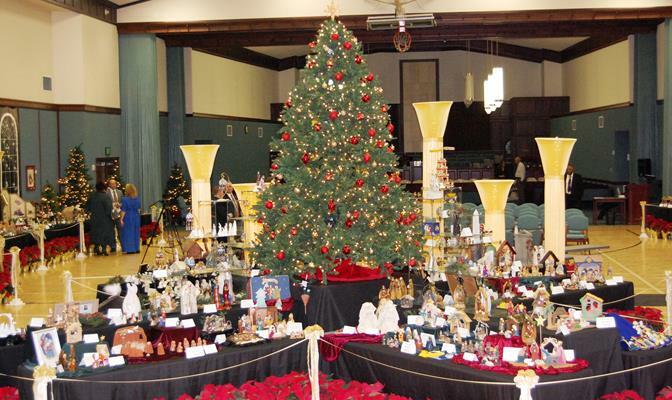 The 19th annual Christmas Crèche Art & Music Festival is presented by the Lancaster East, Lancaster and Palmdale Stakes of the Church of Jesus Christ of Latter-day Saints. The festival takes place from Friday, Nov. 30 to Monday, Dec. 3 at the Lancaster East Stake Center of the Church of Jesus Christ of Latter-day Saints, located at 44330 27th Street East in Lancaster. Events begin at noon each day. View the complete music schedule below. 1 comment for "Christmas Crèche Art & Music Festival kicks off"
This is such a wonderful annual tradition in our family. The nativities are beautiful, as is the music, and it really helps to set the Christmas season off to a great start. The kids love it!